White Silicone Tubing 17mmID x 2.4mmW 25 METRES Product Code: SIL4002. 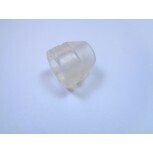 Silicone Tubing - Peroxide - Grey - 8mm ID x 2mm Necta Part Number: 254551	Product Code: SIL4728. Translucent Silicone Tubing 6mmID X 10mmOD Product Code: SIL4522. White Silicone Tubing 7.8mmID x 2.1mm Product Code: SIL4003. White Silicone Tubing 6mmID x 2mmW Product Code: SIL4004. White Silicone Tubing 8mmID x 13mmOD Product Code: SIL4012. Translucent Silicone Tubing 4mmID x 7mmOD - 25 METRES Product Code: SIL4078. Translucent Silicone Tubing 12mmID x 18mmOD x 10 METRES Product Code: SIL4220. Translucent Silicone Tubing 12mmID x 16mmOD Product Code: SIL4521.